The BPL is hoping to lure a younger crowd with its cyanotypes of early tipplers and other blog fare. We love it when stodgy old institutions decide to get with whatever the kids are doing nowadays. Like the Brooklyn and New York Public Libraries, for instance (both of which, before you start accusing us of being anti-library, we proudly belong to -- if you must know, we just extended our checkout time on Alan Alda's autobiography Never Have Your Dog Stuffed, and we highly recommend it, if only for the story about the actor braving life-saving surgery in the Andes - dude is a total badass). For instance, they both have blogs. Blogging@NYPL is predictably more old-school, with posts about Henry James and (topically) Martin Luther King, Jr., as well as posts flagging up must-sees around town, like chrysanthemums at the Botanical Garden. 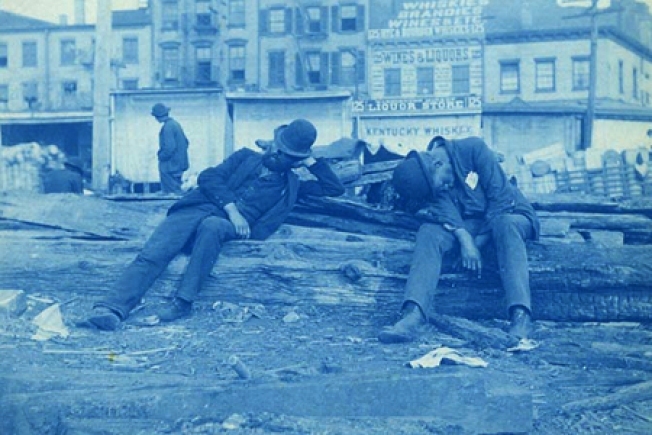 Meanwhile over at Brooklynology (which already gets points for a better name), you got posts about old maps of "Gowanus Bay," and cyanotypes - early photograph processing also called blueprinting - with examples of drunks into bowler hats falling over from "Kentucky Whiskey." Okay, that's cooler. Also, you can fan both libraries over on Facebook -- the NYPL has 438 fans to the Brooklyn Library's 744, so I guess it's Brooklyn by a landslide.